Blessed with versatility, witty writing skills, charisma, heartwarming personality, determination and unwavering confidence you will find recording artiste Pretti Kitti. Pretti Kitti is a talented dancehall artiste whose versatility easily transcends into her music. Her unique delivery and flow has brought a refreshing taste to the dancehall scene which has placed her among the top up and coming lyricists in the music industry. Known to appreciate Afro Beats, dancehall and reggae music, the artiste is looking to develop a strong fan base all around the world. She writes all her music and draws inspiration from her personal experiences and those of others close to her, and real life situation happening. She further drew influences from established acts like Vybz Kartel, Popcaan, Chris Brown, Shabba Ranks among others. The Portmore based artiste has already released singles,"Suga Plum Plum” on split personality riddim the latter featuring self-proclaimed King of Dancehall Beenie Man, Which is her most successful single to date, which has caused her to venture on tours performed in places such as San Andres, Trinidad, Colombia including others, She also have worked with recording artist Charly Blacks and have also been the opening act for various artist. Much of her content has secured a strong fan base on social media. She is also looking forward to win over local and international fans while securing various awards both local and internationally. Whether it is her warm personality, topics on love or her more raunchy dancehall exploits. 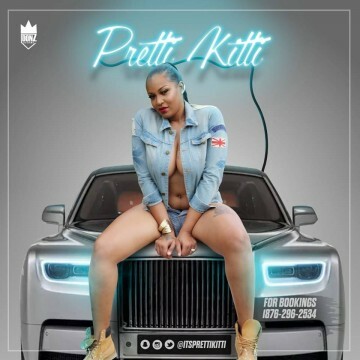 Pretti Kitti continues to make her mark and will be a valuable asset to the entertainment industry, when her constant call is answered with success. Please contact us at Jack Russell Music if you would like to use any of Pretti Kitti’s compositions for film, television, electronic media or covers.